Our programmes are guided by Nature's 'Way of Unfolding', represented by a blooming lotus or mandala. Through opposites, we both draw on and enliven the deep Awareness at the centre of all our experience. A profound inner journey to connect with, and actualize in daily life, the well-springs of creativity and confident expression deep within us. Meditation Intensive for those new to meditation who would like a solid introduction. For those who would like to deepen their practice of meditation and accelerate realization of their true nature. 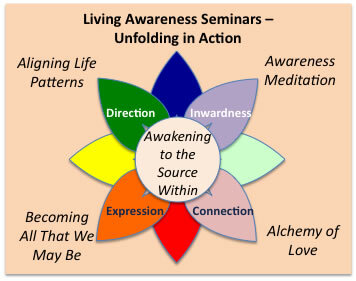 Instruction in, and extended experience of, ‘Living Awareness Meditation’ – a simple yet profound way to calm body and mind, connect with our Source and enjoy greater energy, intelligence, balance and well-being in daily life. 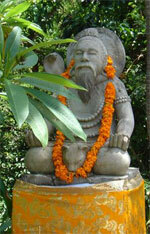 Living Awareness Meditation brings traditional Balinese wisdom to life as a doorway to Awakening. For those who would like to open the heart and deepen their relationships, connectedness, and belongingness. From a deep connection with ourselves, in the crucible of Love, we deepen our capacity for intimacy, service, purposefulness, and passion – fundamentals of loving relationships. For those who would like to know and realize their True Nature in daily life. source and ground of our thinking, feeling, and perceiving. key to effectiveness in action. In this seminar, we explore the nature of our awareness, and the relationship of perception and action to their silent Source in the Non-Dual. We explore ways to recognize and realize that inexhaustible Creative Source in daily life, so that we can rest in our true nature, while coming into alignment with the pattern unfolding in the world around us. 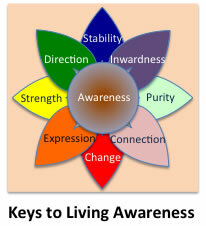 Tuning into and influencing the life patterns and personal epistemology of our clients. For coaches. counsellors, therapists, etc. who really want to get to the core of deep transformation. The programme works on two levels. Participants learn to master the dynamics of deep transformation and while experiencing deep transformation in themselves in the process. Helping the client make changes in internal and external behaviour. Helping the client enhance learning ability and revise interfering attitides and beliefs. Supporting growth and development in the client through the art of Re•Patterning, in particular (see above). Deeepening the qualities of leadership in the coach, while supporting the unfolding of leadership qualities among members of the groups, teams, and organizations he or she is assisting. For details of these Diploma courses, see our Academy website.